If the Scala got an automatic transmission, the Sunny cannot be far behind right? 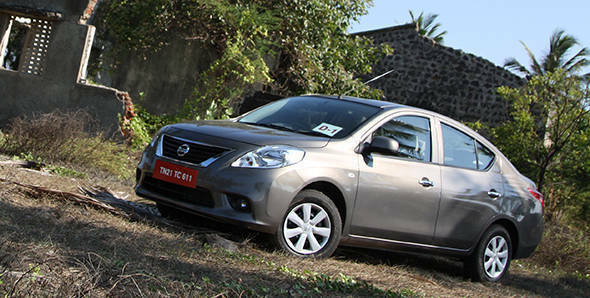 Nissan is all set to launch it CVT equipped Sunny. We got the opportunity to drive the car recently and also managed to do a quick performance test. The auto-Sunny uses Renault-Nissan's X-tronic CVT gearbox that claims to be "so smooth, so efficient". We agree with the "so smooth" bit, because the gearbox actually is quite smooth. There are no jerks when starting from standstill and being a CVT, there is no shift kick as well. It features what Nissan calls Adaptive Shift Control which enables the gearbox to choose from any of the 1000 plus shift patterns based on individual driving style. On the flipside, being a CVT the box does feel very rubberband-y. Progress however is quite brisk. The company claims the car will be over two seconds faster to 100kmph than similar cars running torque converters. We cannot comment on that, but with the car hitting 100kmph in 13.3 seconds, it is quite a quick car (Skoda Rapid AT - 14.6 seconds, Honda City AT  12.4 seconds). Mechanically, it is the same 1.5-litre four cylinder unit making 101PS and 134Nm. As Renault did with the Scala, Nissan also claims that the automatic transmission will be more efficient than the manual with a claimed economy of 17.97kmpl over the manual's 16.95kmpl. The truth about this will have to wait till we fully test the car, but if the Scala's figures are anything to go by, a figure around 13.85kmpl seems more realistic. Initially, only the XL variant will get the auto option, while the other variants will receive them only later. Price and other details will be announced shortly and we will update you as soon as we hear. Stay tuned.